The "Bush bulge" controversy/mystery/national running gag of 2004 began on this very blog. Although I never took the matter very seriously, this site spent an enormous amount of time talking about the whatzit on Bush's back. How could I resist? The whole thing was just too much fun. Times have changed, and the world situation keeps finding new ways to become dire. In 2012, focusing attention on such an issue seems downright silly and irresponsible. But...what the hell. In times like these, we need some fun. "I understand that President Obama and people of his political persuasion would like to take more money. From the American people." Mitt delivers the line in exactly that fashion: He inserts a period into the sentence prematurely, then opens it up again for the remaining bit. (Dubya used to do that sort of thing all the. Time.) A similar oddity crops up when Romney recounts his father's advice. Back in 2008, various writers accused Romney of using an earpiece. I didn't pay much attention to the brouhaha because the Mittster clearly wasn't going anywhere and my attention was on Obama. Nevertheless, the stories floating around at that time were intriguing. Everything hinges on how you interpret this video clip. Somehow, a debate mic picked up the whispered words "He raised taxes" just before Mitt said something similar. NBC later explained that their microphone actually caught someone in the audience. That excuse is ridiculous: You never hear such whispers when game shows and sitcoms are taped in front of a live audience. Armchair investigators posited a number of alternative theories, summarized here. During Gov. Romney’s speech, one of his handlers mentioned to one of our staff people that any time Gov. Romney needed to wrap things up, he would be happy to let Gov. Romney know through the ear-piece that he wore. Being unfamiliar with whether or not presidential candidates wear Jack Bauer-like ear pieces, I simply assumed this was common practice. Zandstra seems sincere enough. I don't know if he had any affiliation with a competing campaign. We can't have a post on such a topic without a good, old-fashioned "back bulge" shot for everyone to examine and squabble over. 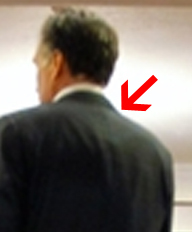 Oddly, it is not easy to find dorsal images of Mitt Romney via Google images. However, we do have this, from which I have extracted the accompanying enlargement. I have not adjusted or sharpened the picture. Is that a rectangular something on his back? You be the judge. It's very subtle -- but to my eyes, something seems amiss. Mitt Romney aides made a sudden decision to remove teleprompters from the hall at his Des Moines victory party because the candidate wanted to "speak from his heart," said Eric Fehrnstrom, a senior Romney official. We even know the brand of teleprompter Romney prefers. When he doesn't use one, he tends to look like a slightly mis-programmed version of a Disneyland robot pirate. You don't even need a back bulge. I wear bluetooth hearing aids and the streamer on my neck loop is small, only 1" x " 3" by less than 1/2" thick. Easily worn under a shirtfront and hidden by a tie. With my cell phone in my pocket, I could easily get someone to feed me lnes. Very true, only subject to potential bluetooth interference. I would feel safer with a less fragile technology. Like radio. Syborg, the "-gate" tradition is by now well-established.